We are thrilled that Yan Yan has joined Green Ivy! 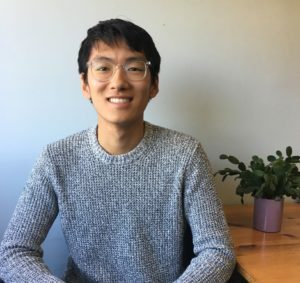 He graduated from the School of Engineering at Stanford University and is current a graduate candidate in Sustainability Science & Practice, with a focus on food insecurity and childhood health. As an undergraduate, Yan Yan worked with Ecuadorean beet farmers through Design for Extreme Affordability, held a public installation of bicultural narratives through food and storytelling on campus, studied abroad in Paris, performed with the Asian American Theater Project, hosted cooking workshops and pop-up restaurants, and mentored incoming Stanford freshmen with the Leland Scholars Program. 1. If you had a free 24 hours to do whatever you wanted, what would you do? Travel to a foreign country with a friend I hadn’t seen in a long time and catch up over street food. 2. Where is a place that you are perfectly content and why? That’s really interesting. No physical place comes to mind, but I’m sure I’ll find that at some point. For now, I’ve learned to find comfort in people and ideas. 3. What was the best moment you’ve had so far this year? I hosted a pop-up on the Stanford campus centering artists of color. It was probably one of the most positive experiences of my life. You can check it out here. 4. You majored in engineering in college. What fascinates you so much about the subject? I love metalworking and woodworking. Being able to draw something on paper, then make it over the course of the week, sometimes by hand and sometimes by ridiculous giant machinery is unbelievably satisfying. 5. What do you love most about working with students? I really enjoy getting to know students as human beings, and empathizing with them. Ultimately, I want be able to support them in their development of resilience, compassion, and thoughtfulness. Best invention of all time: For some reason, I can only think of kitchenware. I love the design of Muji’s rice cooker. I also think the Airpods are the best thing Apple’s come out with in a while.